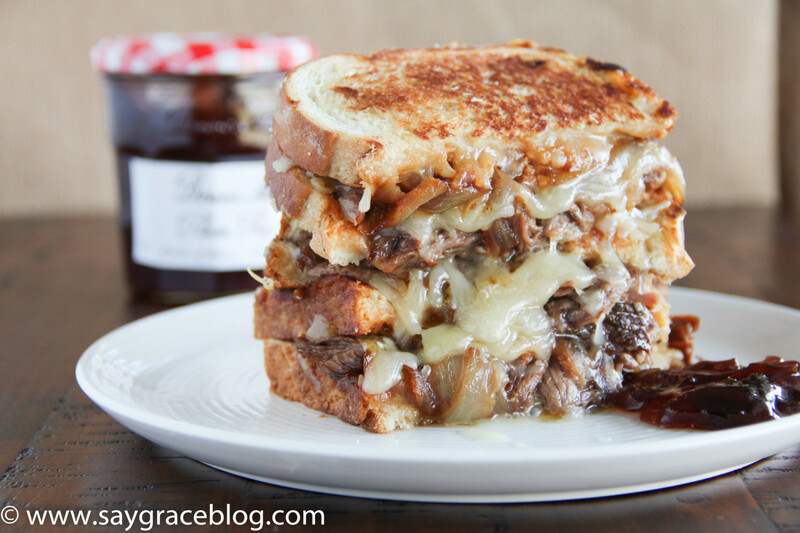 Where cheese and tender, succulent beef collide to take a classic grilled sandwich over the top! You had me at CHEESE… AND THEN BEEF!! It’s time for a praise break!!! Now THIS is my kinda combo! I just can’t get enough of it. From my Outrageous Mac and Cheese Burger to my Pot Roast Mac and Cheese!!! Give me beef and cheese any day!! Happy Grilled Cheese Day to “moi”! I was so excited to begin creating this when I heard that Grilled Cheese Day was coming up soon. There is nothing better than melting cheese over a mound of tender, succulent beef. Sweet baby JESUS IS LORD! I added a plum preserve to the barbecued smoked chuck roast and cheese sandwich to bring an added element of dimension. You have just got to try this! I started by making slits in a 2.5-3 lb. boneless chuck roast. I inserted whole garlic cloves into the slits of the meat. I seasoned it with Famous Dave’s Seasoning and then injected it with beef broth until it began to plump up. I then smoked the meat over cherrywood and hickory chips to increase the flavor and aroma for 2 hours. Now it’s time to take the meat over the top in the slow cooker for an additional 8 hours on low. Be sure to add a sliced Vidalia onion and whisk together about 3 cups of beef broth, tomato paste and apple cider vinegar and pour over the roast to slightly cover. Notice that I keep creating recipes that require a lot of patience. Some great food just takes TIME and plenty of it! I’ll wait. Notice that caramelized onion has been the common denominator lately in my beef dishes. You didn’t think they were going away did you? My advice to is to make them in advance and keep them stocked inside your refrigerator door so that whenever the mood hits you, you’ll always be PREPARED! If you must make them as you go along, here we go! Slice a Vidalia onion about an 1/8 of an inch thick and sauté in a pan for about 45 minutes over medium-low heat with olive oil, butter and salt until deeply amber in color. Deglaze the pan with beef stock and stir with a wooden spoon until all of those lovely brown bits dissolve into the liquid. Set aside. Now that your roast is super tender and falling apart, it’s time to get it acquainted with the other guests at the party, namely fontina, white cheddar, caramelized onions, and plum preserves. Let’s mix your fontina and white cheddar cheeses. Then take your sourdough and spread about two teaspoons of mayonnaise on one side of the bread and about 1 T. of plum preserves on the other side (repeat for both slices). Turn your burner on medium to low heat and allow your pan to heat up nicely. Now place your bread, mayo side down into the pan. Then top the bread with 1/3 cup of the cheese mixture, 1/2 cup of shredded beef, 1/4 cup of caramelized onion, 1/3 cup of the cheese mixture and then place the other slice of bread with preserves side down. After the one side has browned nicely, flip the sandwich over to brown the other side. There I go salivating again! Um boy! Now it’s time to Say Grace and enjoy! 2.5-3 lb. boneless chuck roast. Start by making slits in a 2.5-3 lb. boneless chuck roast. Then insert the whole garlic cloves into the slits of the meat. Heavily seasoned with Famous Dave’s Seasoning and then inject it with beef broth until it begins to plump up. Smoke the meat over soaked cherrywood and hickory chips for 2 hours. Whisk beef broth, tomato paste and apple cider vinegar until combined and pour over the roast. Cook for an additional 8 hours on low. Slice a Vidalia onion about an ⅛ of an inch thick and sauté in a pan for about 45 minutes over medium-low heat with olive oil, butter and salt until deeply amber in color. Deglaze the pan with beef stock and stir. Set aside. Take sourdough and spread about two teaspoons of mayonnaise on one side of the bread and about 2 T. of plum preserves on the other side. Turn your burner on medium to low heat and allow your pan to heat up nicely. Now place your bread, mayo side down into the pan. Then top the bread with ⅓ cup of the cheese mixture, ½ cup of shredded beef, ¼ cup of caramelized onion, ⅓ cup of the cheese mixture and then place the other slice of bread preserves side down. After the one side has browned nicely, flip the sandwich over to brown the other side. Say Grace and enjoy! Grilled cheese of any kind is delicious!! Im sure the meat lovers will appreciate that pulled beef as well 🙂 Looks good! Seriously, every day should be Grilled Cheese Day! This recipe looks absolutely scrumptious — such a delicious blend of ingredients. Holy *insert appropriate expletive here* what an incredible sandwich, I reckon that would keep me going for a whole day! I have such a craving for a grilled cheese sandwich now. It’s such classic comfort food. For sure! Thanks for stopping by Dannii!! I like the food ,It let me good eat and make it . You’ve got to be kidding! I’ll have two! Thanks Jeff! It’s a winner!! That looks amazing, and I love vidalia onions! P.S. I didn’t mean to give it 2 stars! It deserves 5. Thanks Karen!! They are simply the best, right?!?!? There’s only one reaction to a recipe like this. WOW! 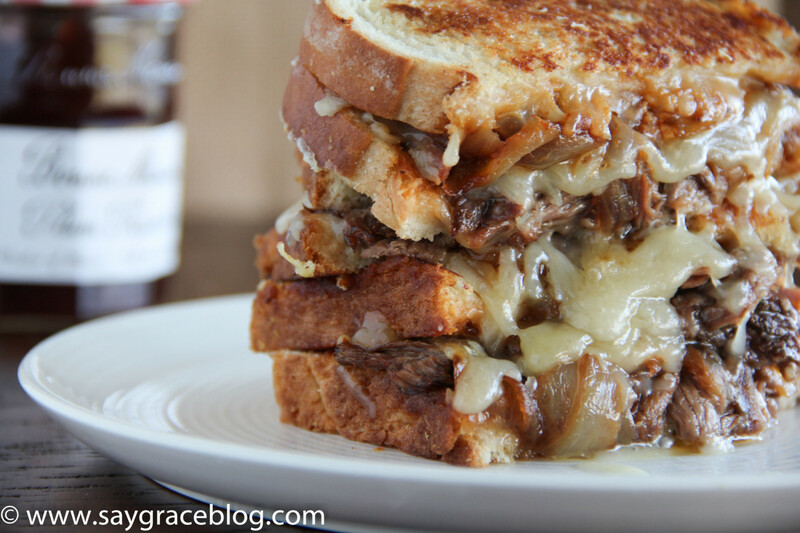 I mean, who doesn’t love a an ooey gooey grilled cheese, a hot roast beef sandwich, and the added bonus of the smoke; all put together in one sandwich; again WOW!!! This sandwich looks delis and I want to make this but I have a question. When frying, directions say to put the mayo side of sandwich face down in pan. So does that mean you will be trying to brown the mayo in the pan and if so when flipping it over what does one put on that side of the bread to brown? One would think you would put the mayo side face up so the cheese and meat would lay on top of the mayo. Sorry if I am misunderstanding the directions, but I want to make this so bad and I want to do it correct. Hi Sandy! Sorry for the delayed response but I just returned from a vacation. The mayo is only on the outside of the sandwich to create a yummy golden crunchy texture when frying. No need to put the mayo inside. Hope this helps!! Hi Karen! So sorry that I missed this comment somehow. I used a smoker over indirect heat. Yes, I used a food injector which can be purchased at any kitchen supply store. I did not cut this meat up before cooking. The whole piece fit right in my slow cooker. Hope this helps!! Glad to hear that Florence!! !